When/where is the Munchkin March? Who hosts the Munchkin March? Can I download a copy of the Munchkin March flier? Why does Mindful Mothers support the Food Bank Coalition of San Luis Obispo County? What type of donation should I bring for the Food Bank? What is there to do at the Munchkin March? What movie will you be showing? At what time? Who are the Munchkin March Partners? What items are being sold at the Silent Auction? 1. When/where is the Munchkin March? The Munchkin March is Friday October 23rd from 5:00-8:00 pm at Meadow Park in San Luis Obispo, CA. Click here to view the park in Google maps. 2. Who hosts the Munchkin March? The Munchkin March was hosted exclusively by Mindful Mothers the first three years. Beginning in 2012 (year 4) we joined in partnership with the City of San Luis Obispo Parks and Recreation Department, who have made the Munchkin March their signature fall event. 3. Who is Mindful Mothers? If you are interested in finding out more about our monthly Playdate With A Purpose, sign up for our newsletter. It includes what we are up to, in addition to other volunteering opportunities and free & fun events throughout the county. 4. Can I download a copy of the Munchkin March flier? Yes! We would love your help spreading the word! Click here to download a pdf copy, or here for a jpg (image file). 5. Why does Mindful Mothers support the Food Bank Coalition of San Luis Obispo County? For the past 5 years, the Munchkin March Parade has benefited the Food Bank Coalition of SLO County; we look forward to working with them again this year. Why the Food Bank? They work really really hard providing members of our community with food. Did you know that 1 in 6 people in our county reached out for help last year? That is 44,000 of our friends, neighbors, and coworkers. The Food Bank Coalition keeps a very low overhead- less than 5%- which allows them to turn every $1 donated into 7 nutritious meals. For every $1 donated the Food Bank Coalition can provide $10 worth of food! 6. What type of donation should I bring for the Food Bank? The simple answer: what ever you can! The long answer: while bringing a non-perishable food item is always appreciated, the food bank has considerable buying power with their suppliers, so they are able to turn $1 into 10 pounds of food when they buy it themselves. But, donating food is still a great way to support the Food Bank Coalition. When families and organizations contribute fresh and non-perishable food, it puts more variety on the shelves and in the freezers. Here are some suggestions for nonperishable items to help provide a well-balanced, nutritious set of foods to those who do not have enough to eat. Click here to see a list of current needs. 7. What is there to do at the Munchkin March? Due to the amazing attendance of years past, the parade moved in 2013 from Downtown SLO to Meadow Park on South Street. It was wonderful- we had lots of room to spread out! Again, this year there will be live music, a photo booth, food trucks, a gymnastics Fun Zone, the PARADE, and an outdoor movie! Bring a blanket, and either grab dinner from the food trucks or pack a picnic dinner, and stay to enjoy the outdoor movie! 8. What movie will you be showing? At what time? The movie, "Curious George: A Halloween Boo Fest" will begin at approximately 7:00 pm (it is 54 minutes long). Synopsis: It's George's first Halloween in the country, and Bill tells him about the Legend of No Noggin -- a headless scarecrow that kicks off peoples hats while roaming the countryside on Halloween. But is the legend really real? George and Allie are determined to find out by taking a picture of No Noggin in hat-kicking action. But first George needs to figure out what he's going to be for Halloween so he can win the costume contest at the town Boo Festival. Will George's quest for the perfect costume interfere with his quest for the truth? Only the curious will find out! 9. Who are the Munchkin March Partners? Plus a great big thank you to our Sponsors and Supporters! 10. What is the Schedule of Events? 6:15 pm: Munchkin March Parade! 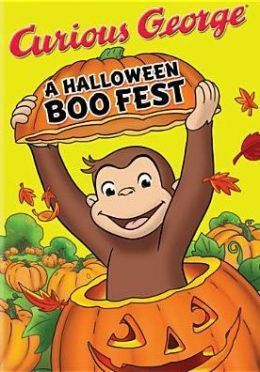 7:00 pm: Movie “Curious George: A Halloween Boo Fest"
11. What items are being sold at the Silent Auction? There will not be a silent auction this year. Please send all donations to the Food Bank Coalition!